There are wounds that will never heal. There are sins that will never be forgiven. What now seems like a long time ago, Shinobu was a vampire. She attacked humans for their blood and sucked immortal monsters dry of energy. Was she evil? Was she good? 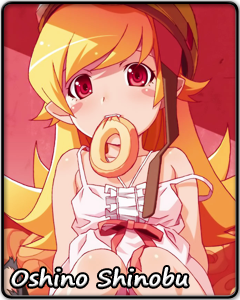 Was the Shinobu of those days even Shinobu? The answers are hazy, lost in the mists of the past. What is she now? The remains of a vampire. A literal shadow of her former self. She is free to hate and despair to her heart's content. She has plenty of time until her immortal being withers away completely. Until that day, she can only watch the world go on without her, her presence no more than a wisp of smoke. But she might also decide to put her past grudges behind her and try to get along with the humans who brought this fate upon her, for better or for worse. At least this way, she is certain to get tasty donuts in reward for her trouble. Her dignity will be hurt if she appears to be overly friendly with mortal beings, though, so she never forgets to bemoan her tragic circumstances at any chance she gets.